Candace Halloway of North Union prepares to field a throw at first base for an out. The Lady Cats cruised to their 10th victory with a 14-0 win over River Valley on Thursday. The Lady Cats of North Union are no stranger to winning and Thursday’s contest against former Mid Ohio Athletic conference rival River Valley was no different. 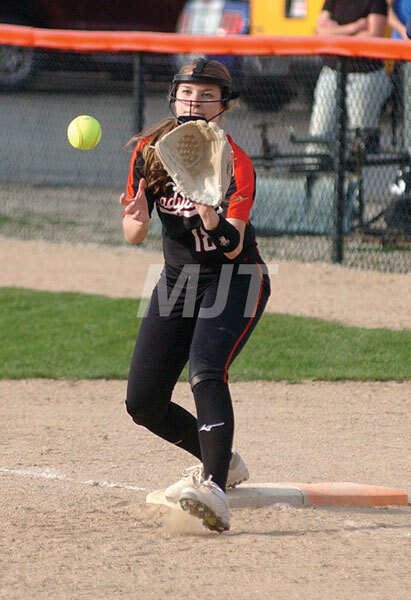 North Union needed only five innings to beat the Lady Vikings, 14-0. In doing so, NU won its 10th game of the season. The Lady Cats, who have shown a propensity to score early, followed suit against RV by picking up four runs in the bottom of the first inning. Josie Duncan led off and reached first base of an error. Regan Martino put down a bunt that River Valley could not cleanly field. With runners in scoring position, Madsion Amstutz singled to the shortstop. She legged out the play to load the bases. Kennady Ruhl drove the ball to the centerfield gap an early 2-0 lead. NU head coach Dawn Draper said playing ahead early is the type of game her ball club likes to play. “Let’s go to work and play ahead,” Draper said. “Playing from behind is not fun. It is awesome if you do pull through, but it is not who we are. The Lady Cats continued their work as Kayle Sedgwcik got the bat on the ball to the shortstop. River Valley attempted to turn the ground ball into a double play, but struggled with the throw. NU continued its solid contact with Laney Converse picking up an RBI single. Destiny Reebel did the same to give North Union a 4-0 lead by the end of the first. Draper said the team, though young, has really been able to get some timely hitting to help win ball games. Duncan got the nod in the pitching circle and did no disappoint as she picked up five strikeouts. NU’s defense also picked up the senior pitcher in the first inning and followed with a three and out in the second. Duncan led off at the plate in the third inning and scored on some solid hits. Draper said NU’s mental focus has been a high priority for the coaching staff. She feels the Lady Cats are starting to really come together as a team. “I think we have put players in positions that they are the best at and I think we are hitting that in our lineup as well,” she said. “We have put a lot of thought into it and the coaching staff is very aware of how we are going to gel. North Union (10-1) went into the fourth inning with a solid 5-0 lead, but decided to end the game early by plating nine runs off six hits. Amstutz and Candace Halloway each had two hits during the inning, while Reebel and Duncan both singled. Duncan ended the game by picking up the final three outs on strikeouts. The Lady Cats will return to action today as they travel to Bellefontaine for a Central Buckeye Conference division crossover game.